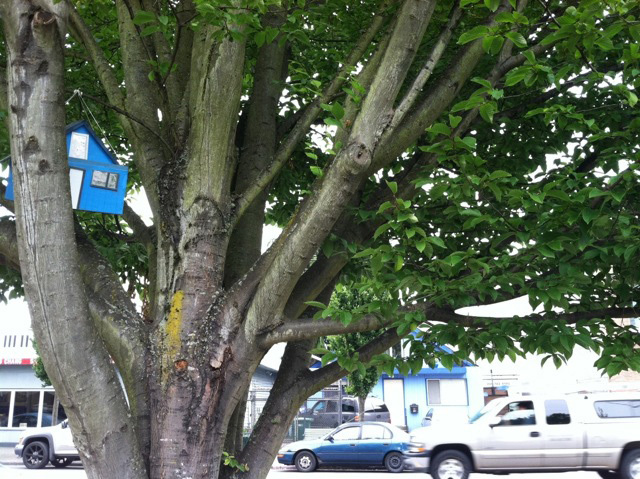 Miniature houses have sprung up in six trees lining Greenwood Avenue. Seattle artist Carolina Silva created the houses, which are reproductions of existing homes located along Greenwood Avenue N between N 67th and N 80th streets. The project is part of Art Interruptions, a partnership between the Seattle Department of Transportation (SDOT), the Seattle Office of Arts & Cultural Affairs and Seattle Parks and Recreation. Art Interruptions is supported bySDOT 1% for Art funds. The miniature houses are made of balsa wood painted and varnished to be waterproof, with Plexiglas used for the windows. Each miniature house was placed in city-owned trees close to the original house. The average size is 10 x 10 x 12 inches. The houses are attached using twine and fasteners that are harmless to the trees. The project Art Interruptions encourages artists to install approved artworks on city sidewalks and parks and offer passers-by a brief interruption in their day with a moment of surprise, beauty or humor. Locations for artworks include street and park infrastructure and street furniture such as railings, stair risers, walls, tree pits and trees. Additional art projects are coming to the Phinney Ridge and Greenwood neighborhood during PhinneyWood Summer Streets, 6 to 10 p.m., August 10, in conjunction with the monthly Art Up Chow Down art walk. Summer Streets will open Greenwood Avenue N between N 67th and N 87th streets for people to stroll, bike, shop and just enjoy being in their community. Partnering with the Greenwood Arts Council and the art walk means this event will be a bonanza for art lovers. Along with Art Interruptions, art displayed inside of businesses and yummy eats at Summer Streets, Tasty, a shop featuring original art, is hosting their Third Annual Street Art Fair. Local artists will showcase their wares and chat with passersby. Visitors will also be able to watch artists work in various media, including painting, printmaking, woodcarving and stone carving, created right in front of their eyes by Art on the Ridge. A little farther north, outside of the Greenwood Collective, people will be able to observe large art canvases come alive. For more information about PhinneyWood Summer Streets please go to www.seattle.gov/transportation/summer_green.htm. To learn more about Art Interruptions…keep your eyes open August 10!